In the spirit of New Year’s coming up, we are all reflecting back on the year as well as looking forward to the next year! To end the year, we will be holding our first giveaway! All you have to do is like our page on Facebook and comment on our post about this article, telling us your favorite chess event of the year- either one you watched or attended- and one you are most excited for in 2017! We will randomly pick a winner January 31, 2017 and message them, asking for an address to send the prizes to. This was my fifth time in a row playing in this tournament! Held in Parsippany, New Jersey, the tournament is a bit isolated from tournaments I’m used to in the Northeast (Philly, NYC, Boston, etc.). However, it never fails to disappoint. It’s been a bit of a tradition for me to attend every year, and I’m glad I did since I met Irina Krush for the first time one year, as well as the legendary Garry Kasparov! Oftentimes, I play tournaments in hopes of earning a bit of prize money, but this is one of the tournaments I play completely for fun. My goal this past USATE tournament was actually just that, to have fun, as I was convinced it would be my last USATE tournament for a while since I would go to college (which turned out to not be true, as I will likely be going in 2017). My team ended up tying for first place under 1500 (average team rating), but we lost the tiebreak so we did not earn the plaque. It was the best my team ever performed at USATE, but I was also on a team with some friends and was able to see many players that I rarely see otherwise. BEST WEEKEND OF MY LIFE! I think the article says it all. The WCC was my first time attending any sort of elite tournament in person and it just happened to be a world championship. It was at this event that I met the greatest variety of people, from chess journalists to chess enthusiasts to chess players. I was also able to see many friends that traveled to see the first world championship on US soil in many years. Quite intriguing was the fact that I gained new journalistic opportunities. For Chess^Summit, I became a regular contributor and wrote a well received, well researched article about the WCC tiebreaks. For Chess Club Live, I was promoted to Director of Journalism and they also covered my costs to attend the event. For US Chess, I was able to write an article about the format of the match. Overall, I feel like I was blessed to attend the World Chess Championship in the city I live in. Honorary events: The two US Chess School camps I went to in NYC! I wrote an article about my first experience earlier in the year. I love helping out with social media and taking pictures during the camps. The kids who attend the USCS are always extremely inspiring to me. This will be the first time I go to St. Louis! This past year, I followed the tournament every day and decided 2017 HAS to be the year I actually go! I always enjoy the St. Louis Commentary team and have been wanting to meet Yasser for a long time. I am planning to go during my spring break (April 11-18), and will stay there after the tournament in order to spend time at the Chess Club and Scholastic Center of St. Louis and the World Chess Hall of Fame. I will be cheering for several friends, and I think it will be quite an exciting tournament to attend. My picks for the US Champs of 2017? Fabiano Caruana and Nazí Paikidze-Barnes (the two winners of 2016). I cheated by grouping these two events together. I’m not entirely sure I’m going to these tournaments as of right now, but I’m hopeful. Going to these tournaments would be quite an adventure, as I have never been to Europe before. I followed these events this past year as well, and rapid/blitz tends to always be exciting to watch. I cheated again! I grouped these tournaments together because they are both in St. Louis and one after another. I have never been to a Sinquefield Cup before, and they are one of the most intense and exciting tournaments of each year. This tournament always has a strong showing and gains a lot of attention. What was your favorite chess event of 2016? What are you looking forward to most in 2017? Remember to comment on our Facebook post and you could win our first giveaway ever! Heading into tournaments, I have always been asked how it is I prepare – do I play lots of games online? Memorize openings? Study books? Listen to lectures? Ideally, it would be a combination of all of these… but with high school and now college, time hasn’t really allowed for it to happen. Before anything else, it is important to understand what is one’s stronger points and weaker points – for me, I tend to be easily drawn to very aggressive tactical plans while I have always struggled with positional games where I really shouldn’t even be thinking about sacrificing a piece. Once you know what your weak points are, concentrate on those. Again, for me that would include looking at examples of strategic piece placements as well as learning and grasping a better understanding of my openings (something else I have always struggled with). Of course, what I have been speaking of so far is the kind of long-term plan that one should always be aiming towards. But what happens if your upcoming tournament is in a few weeks, or even a few days? In such cases, I suggest very strongly that you blitz through as many tactics as you can a day and play blitz games online when possible in order to build your instinct, which will help with analyzing any position you are faced with more quickly in the tournament. As simple as this may sound, sometimes the deciding factor of who comes out as the victor in a game is who is able to think on their feet better and who is wasting less time simply grasping an understanding of the position. Another semester finished! 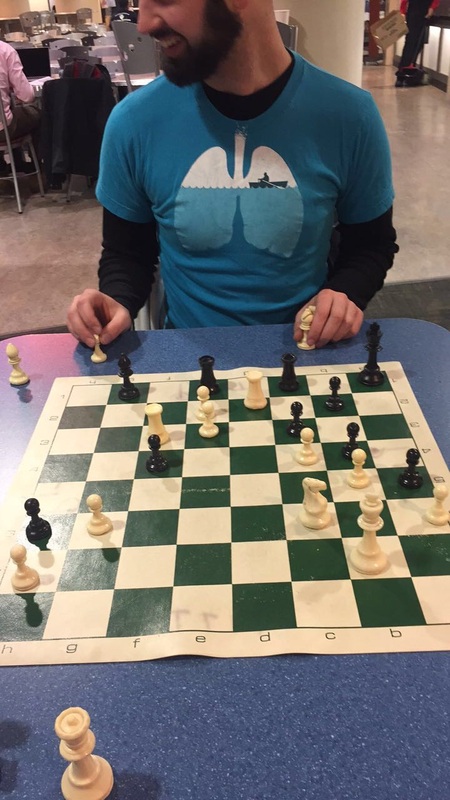 While most college students will be looking forward to these next few weeks to decompress, I’ll be hitting the books to get ready to play tournament chess again – though I have to admit, I’m planning for my preparation to last a little past the Pan-American Collegiate Chess Championships this week. That moment when you realize finals are over! Since the US Junior Open last summer, my goal to reach National Master hasn’t exactly gone as smoothly as I had hoped. After being humbled in Philadelphia at the World Open and then again in Orlando, I had to seriously revaluate my goals and work ethic going into the Washington International. Even though I showed significant improvement over the board, my score in Rockville showed there was still a lot of work to do to reach National Master and beyond. By the time I started my fall semester, many of my games felt like I was just trying to prove that I was where I was a year ago, and each poor result felt like I was running into an invisible wall of sorts – what happened? To an extent, I do think my workload hurt my ability to improve as the semester wore on, in some cases even forcing me to pass on tournaments to stay on top of my classes. Outside of my weekly games with Beilin, I also haven’t had many opportunities to play opponents rated over 2000 – six to be exact. Needless to say, that’s not a good number for anyone trying to play at high level, goals aside. So now what? As 2016 concludes, I’ll be entering my thirteenth year of playing chess competitively. While I only started to take my development seriously about six years ago, I’ve always loved the idea of playing abroad, and I got my first chance in 2005 at a local Osaka tournament. While Japan isn’t known for chess, having family there made arranging travel easy, and I returned in 2008 and more recently in 2013, punctuating that trip with a 4th place finish in the Pan-Japan Junior Chess Championships in Tokyo. Last May, a particular US Chess article by then-FM Kostya Kavutskiy (who has since written for Chess^Summit) about his trip to Europe reminded me of the adventure it truly is to play overseas. While the dream of going to Europe had been in the back of my mind far before reading his article, I had never really stopped to think when or if it could happen. Being a second year mathematics major at the University of Pittsburgh, I can certainly count on my classes getting tougher, and beyond that, I have no idea what life will bring me. After weeks of on-and-off discussion with my parents, we finally decided to take off my 2017 spring semester so I could travel to Europe and compete in various tournaments. My dream was coming true! Once the US Junior Open finished last June, I started drafting iteneraries and researching tournaments. It wasn’t until I left for Pittsburgh when I had a firm itenerary set, and much later when I purchased my airplane boarding passes. With no classes from now through late April, this will likely be the last time in my lifetime (or at least for a very long time) I can put everything else aside and just focus on chess for an extended period of time. I won’t be leaving for Europe until early February, so I’ve also arranged for some tournament appearances stateside too. Enough chatter – here’s what I’ll be up to for the next few months! I have three tournaments in the United States before heading off to Europe, and somehow each of the three locales are of unique interest for me. Marking my return to the site of the US Junior Open. The competition will be tough, but Pitt brings its strongest ever team to the tournament. Last time I played in the Big Apple, I broke my curse and won my first ever adult tournament to kick off my summer. This time I’ll likely enter as a much lower seed with the hopes of gaining some experience against top notch opposition. In my last tournament before I head to Europe, I’ll revisit the battleground of the World Open. Trust me, I’ve had this circled on my calendar for a while now. Having never been to Europe, I can’t tell you as much about the venues. But as always, I’ll be posting to Chess^Summit throughout the trip, so make sure to stay tuned! I’m also planning on touring Paris, Munich, Venice, and Vienna throughout my stay. I will be leaving in early February, so in total, I’ll be abroad for 82 days and get in 46 rated games in Europe. Including my games before I leave, I’ll play a total of 62 games this ‘semester’! I’m very curious to see what this trip will bring to my game, and I am looking forward to the many on- and off-the-board experiences I will have while I’m away. I’m really thankful for everyone who helped me put this trip together – my parents, my coach GM Eugene Perelshteyn, various tournament directors, as well as anyone who has offered me any advice along the way! I’m planning on making the most of this opportunity, and I hope all of you will follow along here on Chess^Summit! With the annual K-12 National Scholastic Chess Championships ending less than a week ago, I felt that it was a relevant time to write about national tournaments in general. The National Scholastic Chess Championships have been around for a long time. In its younger days, these tournaments were full of strong players and were a must-attend. However, in more recent years, the overall strength of these tournaments has decreased. Why that has been the case? I can’t know for sure. Travel costs haven’t increased; if anything, they’ve been decreasing. The number of players in the US has been on the rise every year. In that case, what is the reason for the decrease in interest in these tournaments? Perhaps it has to do with age. Every section tends to have fewer players as the grade level increases. That could be due to the fact that high school workload is exponentially greater than that of an elementary schooler; in addition, these tournaments require missing a day of school. Another possible reason to abstain from playing in these tournaments is rating. This is especially apparent in the higher rated players. The circumstances of the tournament make it a very probable that high rated players will lose rating by the end; these include the relatively high number of rounds per day, short time controls, and facing opponents who only play in scholastic tournaments. Now, I’ll admit, I have lost rating in most of these tournaments, with the exception of a few. Despite the change in rating, though, I was still able to receive place trophies for the performances. Though I understand why these reasons might deter kids and/or parents from participating in these tournaments, I have a strong belief that the benefits of these tournaments outweigh the costs. There is much experience to be gained from playing in these scholastic tournaments, especially of one’s goal is to play in national open tournaments at a later point in time. Schedules would be awfully similar, with multiple rounds per day, and traveling being tiring as always. These tournaments also provide kids with the ability to spend a weekend away from work and being able to play the game they love. They are able to meet kids from around the country and just have a good time altogether. I’ve made a point to attend every single K-12 tournament since I began playing chess almost seven years ago. This past tournament, however, I had to miss, but it was not for any of the aforementioned reasons. The tournament had to be inconveniently scheduled the week following my week-long marine science field trip to the Bahamas. Missing an entire week of school proved to be too much to handle, and the workload would have been unmanageable if I missed yet another day of school, especially since I had two tests from two AP classes on that Friday. However, I am 110% sure that I would have gone if the field trip and the tests were scheduled earlier or before the actual timing. Since I missed this one, though, I do not plan on missing the next national tournament May of 2017, which happens to be the Supernationals. These national tournaments typically boast a much stronger field due to their rarity – it’s a quadrennial event. If you have not played in a national tournament yet or have not played recently, I highly suggest you try to make this trip out to Nashville. Similarly, if you are an adult and are unable to play yourself, try to convince as many kids as possible to play. It will truly be an unforgettable experience and worth the costs. Although it’s still approximately six months away, the sooner you begin to plan for the trip, the better. So, I hope to see as many of you as possible over there! And, as always, see you next time! During another Friday evening game with Isaac, I battled through one of the ugliest openings ever to reach an ending up a piece for two pawns, but facing a rather formidable pawn storm. I was soon able to capitalize on an error to end matters quickly, but we felt compelled to spend a good chunk of time (and several impromptu mini-games) debating the merits of material versus activity in that endgame. The short answer (according to me) was that material should eke out a win. The bar for compensating for lost material isn’t simple to meet. The flip side has burned me a few times as well, but more often than not, the material scale in chess is a good one. Isaac thought Black’s upcoming pawn storm would be crushing. We’ll get to the opinion of a certain silicon friend later. Objectively, Black is still in the game, but Black’s temporary neglect of e6 and the cornered h7 bishop gives White good play on the light squares at the expense of a pawn. 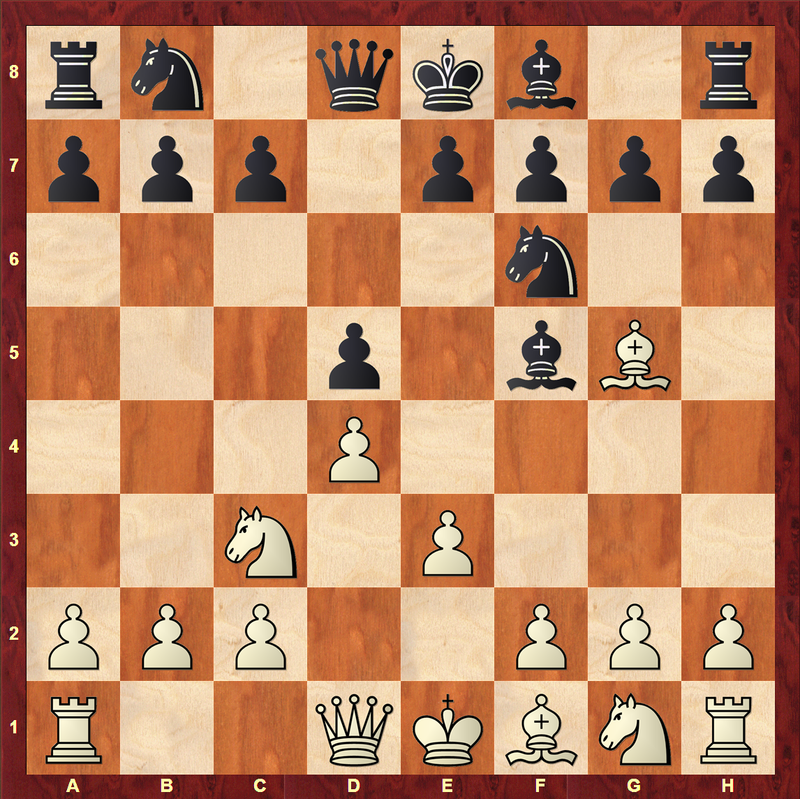 Now White can accept a slight weakness in exchange for kicking the bishop with f3, or slowly go after the tripled pawns. I chose the latter. It looks like Black will have to trade rooks and move out of f6, allowing an unpleasant Qh5+. But with d4 en prise and Black up a pawn, there is another option I hadn’t considered. Black gives up the knight for a mass of admittedly scary-looking pawns. The next few moves are virtually forced. In hindsight, I would have expected 20. Be3 to go fairly smoothly. Unfortunately, this is no longer possible after 20. Nc3?! (seeing if Black will fall for 20…Kxd4? 21. Nb5+ and 22. Nc7, but what else?) 20…Nc6 21. Nxc6+ bxc6. As I mentioned above, I wasn’t particularly worried about Black’s pawn rushes, but now that Be3 is no longer possible due to …d4, developing the queenside was proving a bit more annoying. Fortunately, Black didn’t do much to inhibit my makeshift queenside development plan and fell victim to a tactic on e4. 22. Ke2 g5 23. f3 Bb4 24. Bd2 Rh8?? 25. Nxe4! Isaac had apparently overlooked that after 25…Rh2+ 26. Ke3, 26…Bc5+ was impossible. After 26…dxe4 27. Bxb4 exf3? (27…Rh3 last chance to put up resistance) 28. Kxf3 Rxc2 29. Bc3+ Kf5 30. Kg3, I quickly rounded up f6, and later the other pawns. Right away, we can see that White’s bishop is rather inhibited and Black’s plans involving …d4, f- and g-pawn storms, and going after the f2 pawn, the last resistance to Black’s potential passers. None of this was particularly convincing to me, since pawns (even several of them) aren’t particularly effective against minor pieces and White’s only real weakness is f2. While it may take White some time to untangle (although untangle White does, after …d4/Nd1/b2-b3/Nb2 etc. ), the extra pieces give White extra tactical possibilities and defensive opportunities to compensate for the lost time. I thought the ending would always be tricky in practical play, but was probably much better for White with best play. Of course, these judgments call for empirical analysis, so Isaac and I blitzed out the ending from the original position several times, which didn’t help our cases too much; I dominated the first few games, but Isaac more or less closed the gap in the last few. Isaac may have overlooked the aforementioned tactical resources for White, but I was surprised to lose a number of close bishop vs. three-pawn endings. I did note some of the earlier simplifications into equal-material or pawn-up (for White) endings, just to confirm that the ending wasn’t completely winning for Black. Eventually, we lended an ear to Stockfish, who evaluated the position after 21…bxc6 as +1 for White, basically in line with White’s material advantage. Unfortunately for me, the evaluation dwindled to 0.0 after 22. Ke2 (Stockfish liked 22. Ne2) 22…d4 23. Nd1 (Stockfish preferred a4). 27. b3 is closer to what I attempted in most of the mini-games, providing a flexible choice for developing the big pawn on c1. After 27…Rh2, it seems best to disrupt the potential …e3 threats with 28. c3 d3+ (28…c5 looks possible, but opening up the c-file could prove fatal for Black) 29. Kf1 Rh4 30. Be3 (finally! ), and perhaps 30…g5. Now that White is finally untangled, 31. Bxa7 seems tempting, though I’d probably start worrying again after 31…c5 and questioning whether White really needs or wants the extra material. Against the straightforward 31. Kg2, Black might be out of gas, although there are still some tactics to watch out for. One caveat is the potential minor piece vs. 2-3 passer endgames, which could be more complicated than I’m letting on. I’d personally defer these possibilities to someone with more feel for time and those endings. The above is, of course, just one line of many. In a complicated ending that starts at +[0,1], there’s enough room for the position to swing either way. As it turns out, Isaac and I underestimated (at least a little) the resources at each other’s disposal. A material advantage is powerful, and provides a lot of security in terms of tactical options (more powerful pieces, more possibilities) and conversion (into simpler positions). On the other hand, it is entirely possible for activity to produce longer-term advantages or tactical opportunities (which I missed) with a few great moves or inaccuracies from the other side. Our analysis is yet another reminder that my endgame intuition isn’t quite crystal clear (based on my eagerness to trade into losing piece-for-passed-pawns endings!). And whatever your faith in material advantages, structural advantages, spatial advantages, or activity, there’s always more than meets the eye! The final tournament of the Grand Chess Tour is finally upon us: the London Chess Classic. Wesley So, the winner of the Sinquefield Cup, is far enough ahead of the other players in the Tour that the only way for him to not win would be for Hikaru Nakamura to win the London Chess Classic. Oddly enough, So and Nakamura had to face each other in the first round of the tournament – ultimately resulting in a win by So with black. As of right now (after Round 5), Wesley So is in the lead by half a point in front of Caruana, Kramnik, Aronian, and Nakamura. Should things turn around, there is still a chance that someone will take over the tournament! This year’s tournament has been relatively more exciting than last year’s where there were many rounds of only draws and most rounds were primarily composed of draws. Another point that is very interesting this year is that the World Champion Magnus Carlsen is not competing. Nevertheless, the field is extremely high-leveled and competitive. The tournament so far has turned out many exciting games – I advise you to explore them all, even the draws! I can’t wait to see who comes out as the victor in this close race towards the finish line and to all those college students out there – good luck on your finals! Even with term finals coming up, I’ve snuck in a few blitz games! Here’s a fun position I got with White… Good luck finding a non-losing for Black! Without any new tournament games to share with you all for my post today, I was delighted when I recieved a Free Game Analysis request from a strong player in the Pittsburgh area last week. As many of you know, Chess^Summit offers Free Game Analysis to all of our readers, and if you want to join the fun, you can send your game PGNs to chess.summit@gmail.com, along with any questions you may have about the game! Today’s game was submitted by Pitt teammate Behnam Esymali. Behnam recently crossed 2000 at the Pennsylvania State Championships, and has since proven to be a cornerstone of the University of Pittsburgh Chess team in our local league matches. Off the chess board, Behnam is working on his PhD in mathematics, and writes regularly for the American Mathematical Society Graduate Student Blog (you can check out an article of his here!). In his game today, Behnam chose the Veresov as White, an opening I discussed extensively for Black in my post about my World Open post last summer. While the Veresov doesn’t really promise any advantage for White, its rarity has made it a good surprise weapon. Even at the Grandmaster level, these 1. d4 d5 2. Nc3 openings have started to gain attention, particularly from Baadur Jobava, the star of the Baku Olympiad. The focus for today’s post. Does White have anything after the push 4. e3, or does Black get an easy equality? Even without the most accurate play Black got a respectable position. What I like about this game is that it shows that even if you want to avoid main line openings, you still need to have some theoretical understanding to put together the best blueprint for the middlegame. In this opening, White erred as early as move four and was stuck with an equal position until the early middlegame when Black misunderstood the position and left his king exposed in exchange for a pawn. Moral of the story? Know your openings!